New indie alert! Recently, JOHNNY CONCERT asked if I’d be interested in reviewing some of their products for you guys and of course I had to say yes since I know how many of you are interested in VEGAN MAKEUP. This brand has been around for awhile now but these are the first products that I’ve had the pleasure of trying. They sent a lot of stuff but first we’re checking out their WINTER BUNDLE. This set is currently sold out but will be restocked soon. I recommend signing up for their VIP program (it’s free) so that you’re informed about new releases and any special offers they might have. This set includes 5 eyeshadow pans. STUDS + SPIKES is a dark smokey gray with silver glitter. CROWN OF ROSES (love!) 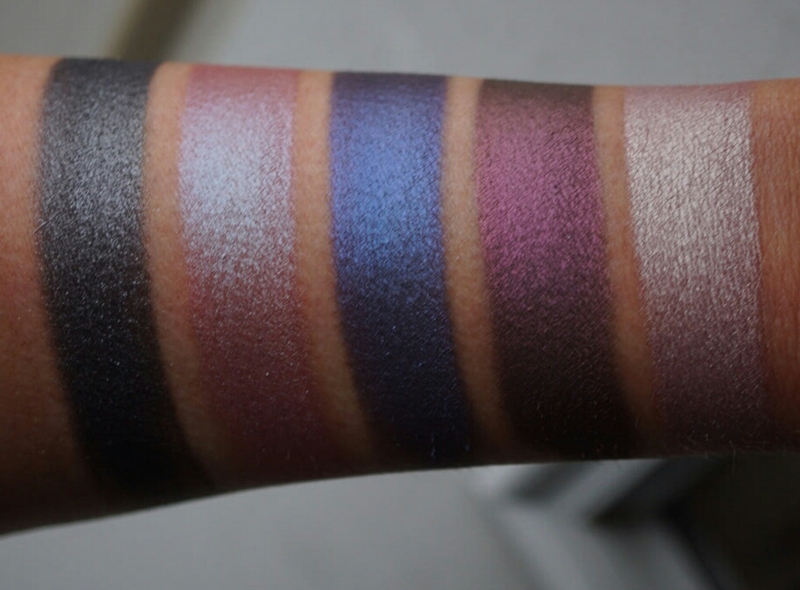 is a soft pinky lavender with a blue duochrome shift. SMASH STEREO is a deep periwinkle blue with a purple shift. GRUNGE & GLORY has a dark gray base with a heavy plum overlay. 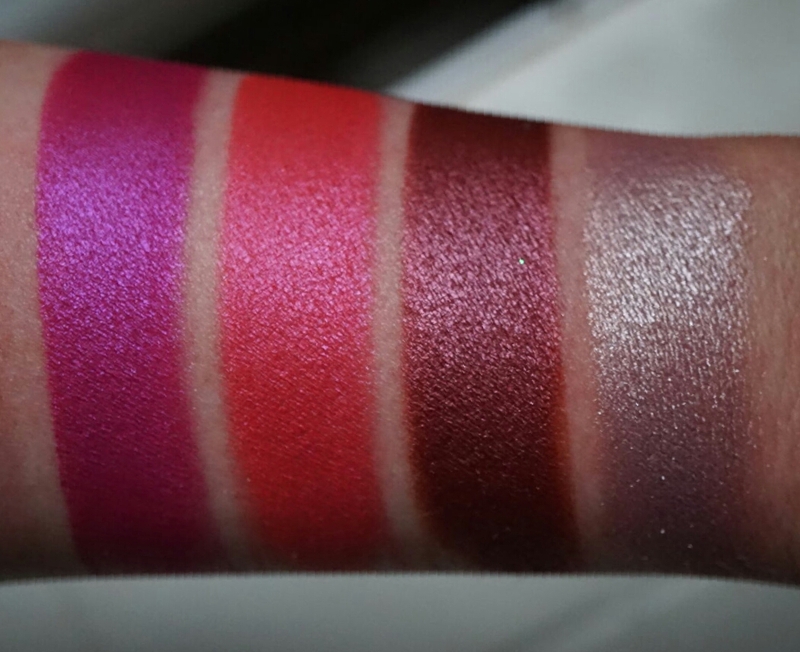 BAD KITTY is a pale shell with pink shimmer. 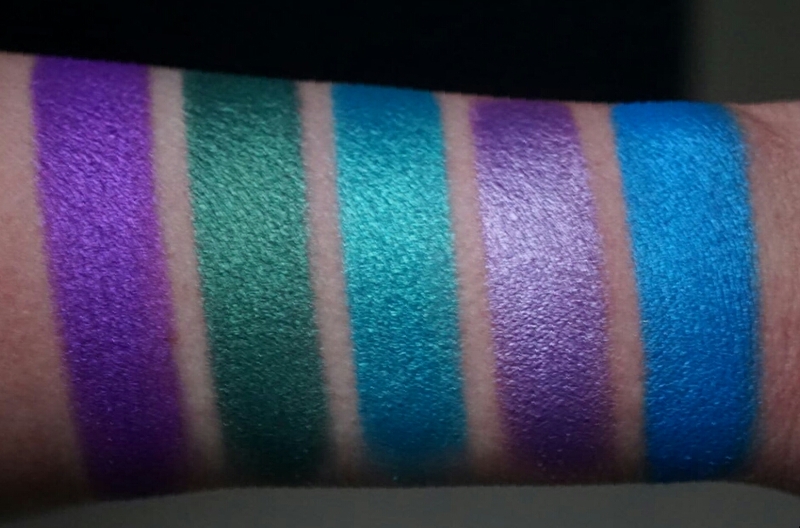 Right now it’s being sold as a collection but later this winter the shadows will be sold individually as well. It’s a really interesting blend of colors. CROWN OF ROSES is my jam and I also love GRUNGE & GLORY and BAD KITTY. And SMASH STEREO… so all of them really. 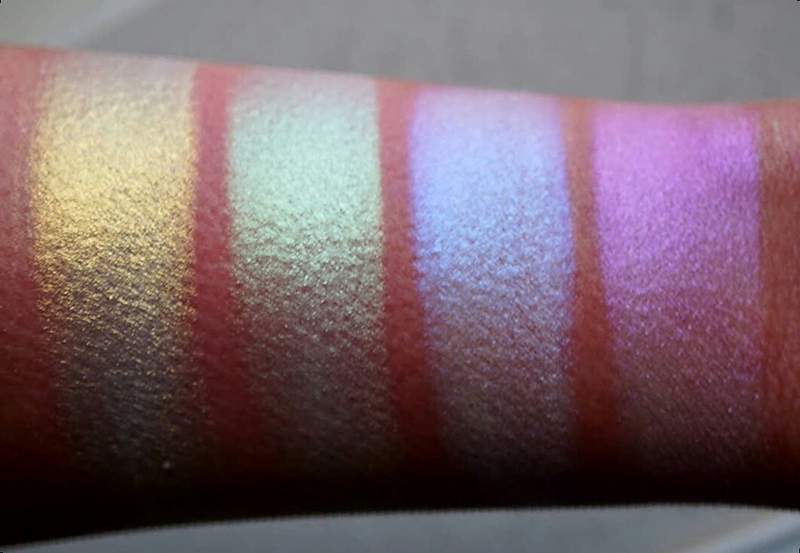 Speaking of KVD dupes… since there’s been so much talk about the KVD ALCHEMIST PALETTE, I figured it was only appropriate to post these next. 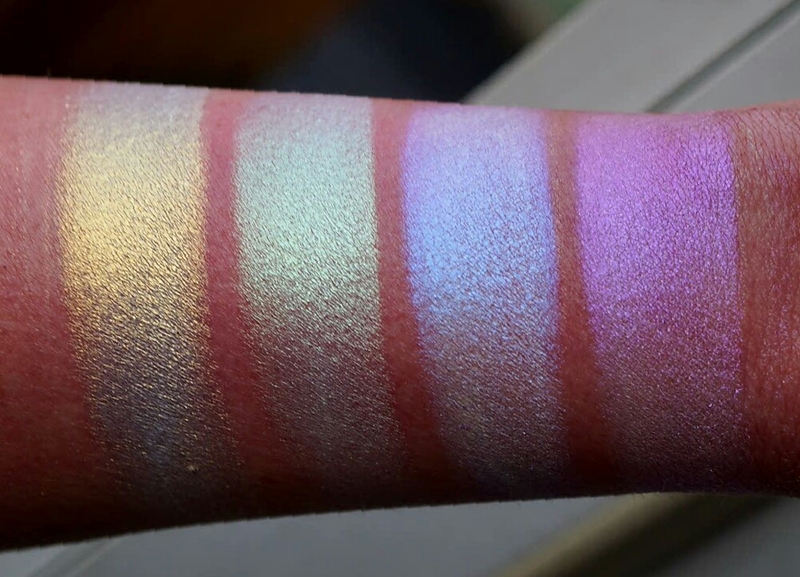 These four products are called EYELIGHTERS and just like the ALCHEMIST palette, they can be used as eyeshadows, highlighters, lip toppers etc. They’re all white based powders with different colored reflects. LUST DUST is yellow gold. TRAGIC MAGIC is a minty green. 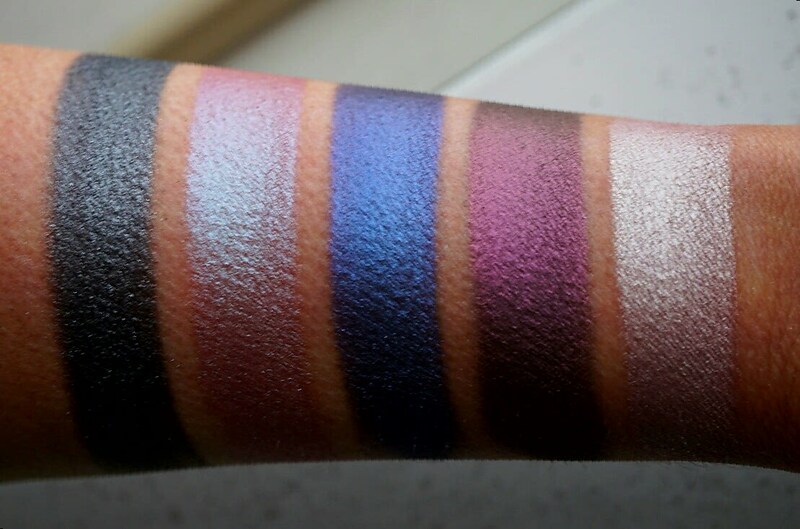 DREAM OBSCENE is bluish purple. 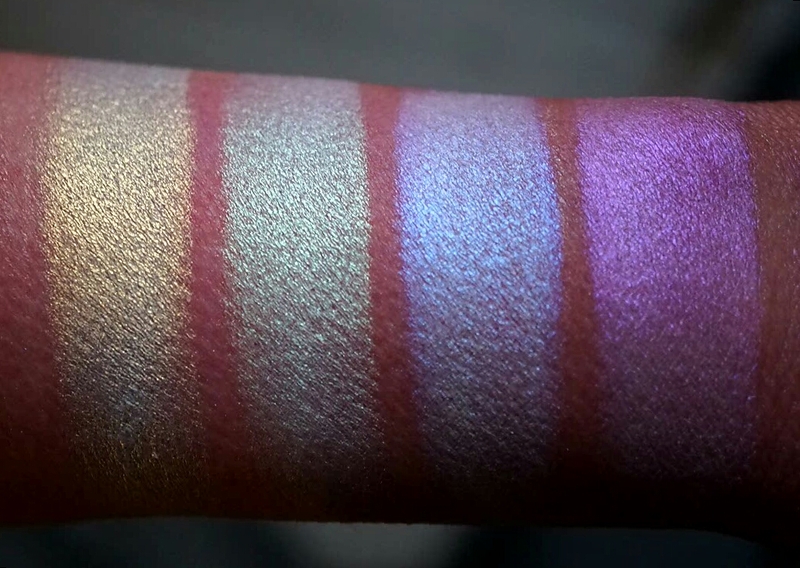 AURA AURORA is a pinky lavender. 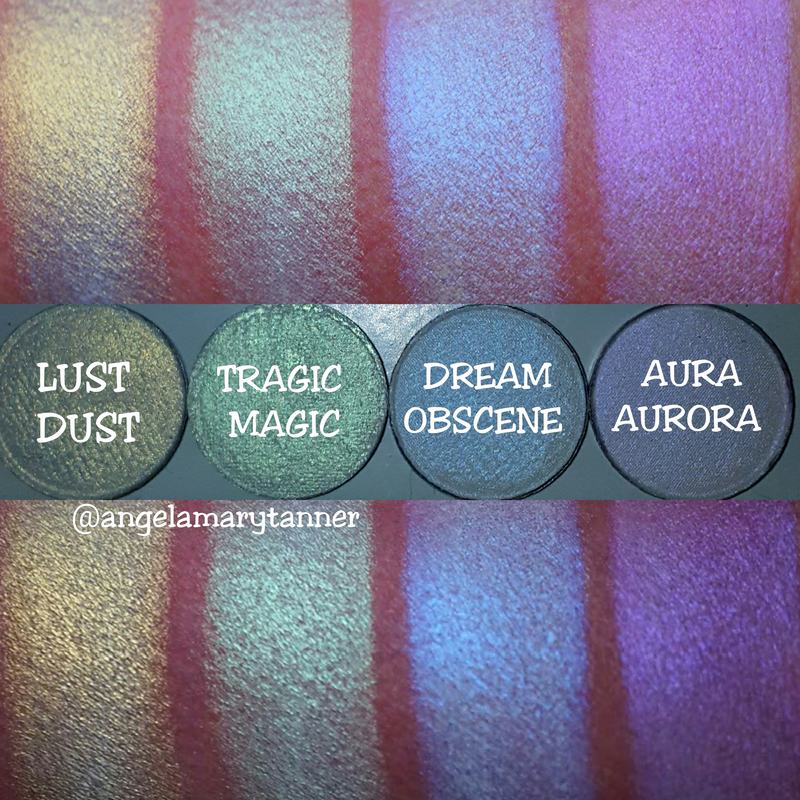 TRAGIC MAGIC is very similar to EMERALD from the ALCHEMIST palette and DREAM OBSCENE is dupe for AMETHYST. One of the things I love about these products is how different they look over different bases. 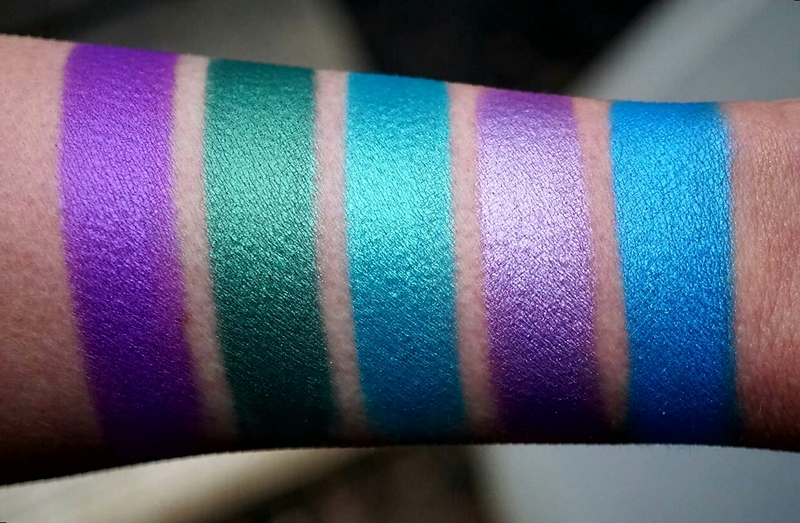 If I ever get caught on my swatches and reviews, I’ll swatch these over some different colors for you guys. Oh hell yes!!! Now we’re speaking my language! 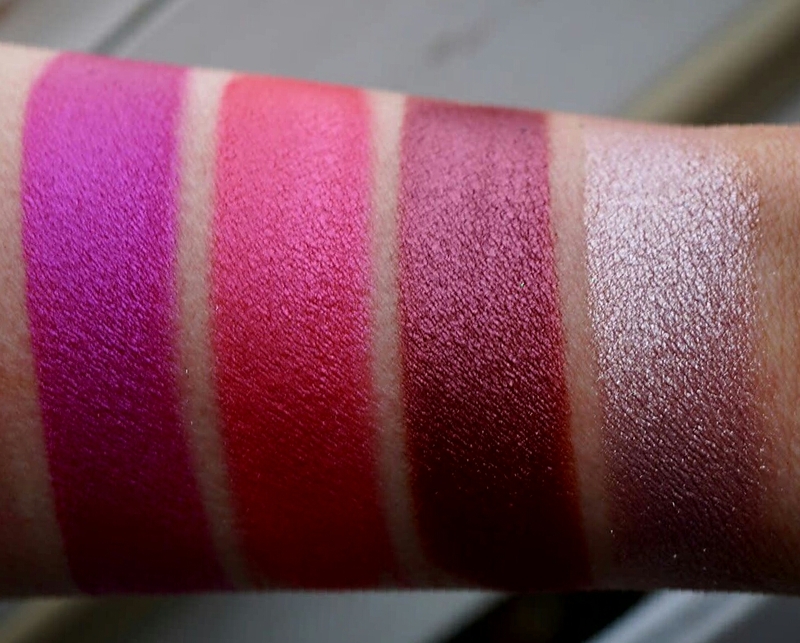 We’re now onto the third set of JOHNNY CONCERT swatches and these pinks and reds are my FAV! I can’t get enough of these colors!! SCENE QUEEN is a fuchsia pink. SCREAMO is a bright coral pink. BLOOD MOON is rich burgundy. TAINTED CUPCAKE is pearly pink champagne. 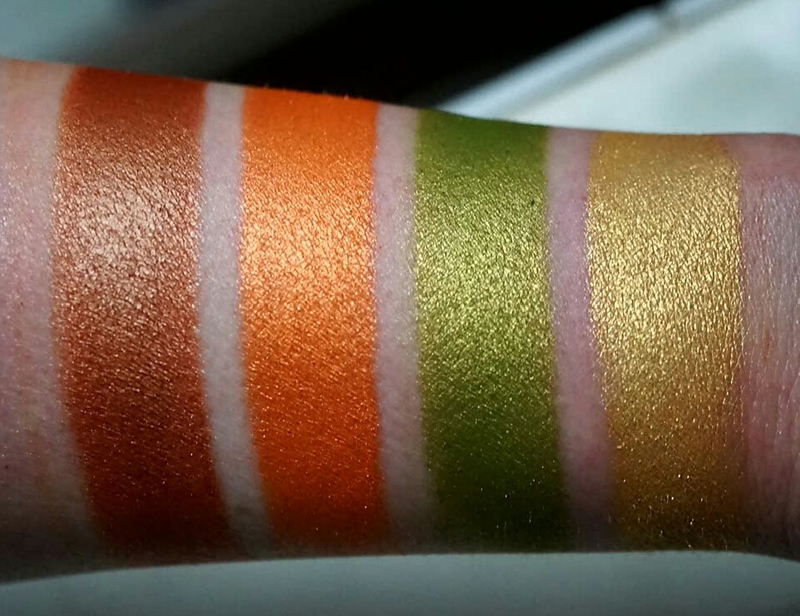 All four shades are dense, creamy and highly pigmented. They’re easy to work with and long lasting and I honestly don’t have a bad thing to say about them. 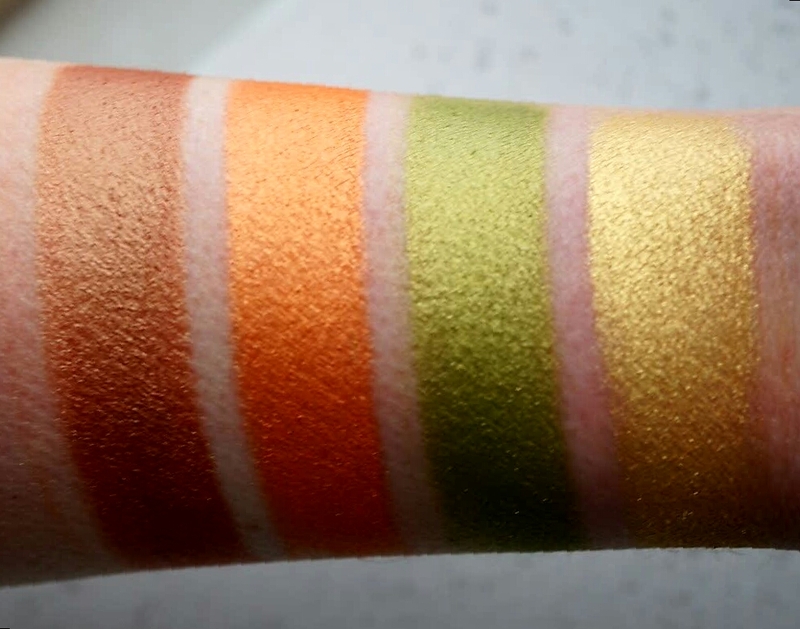 Next up… oranges, greens and golds! METAL REBEL is coppery bronze metallic. WILD THANG is a bright orange sherbert. 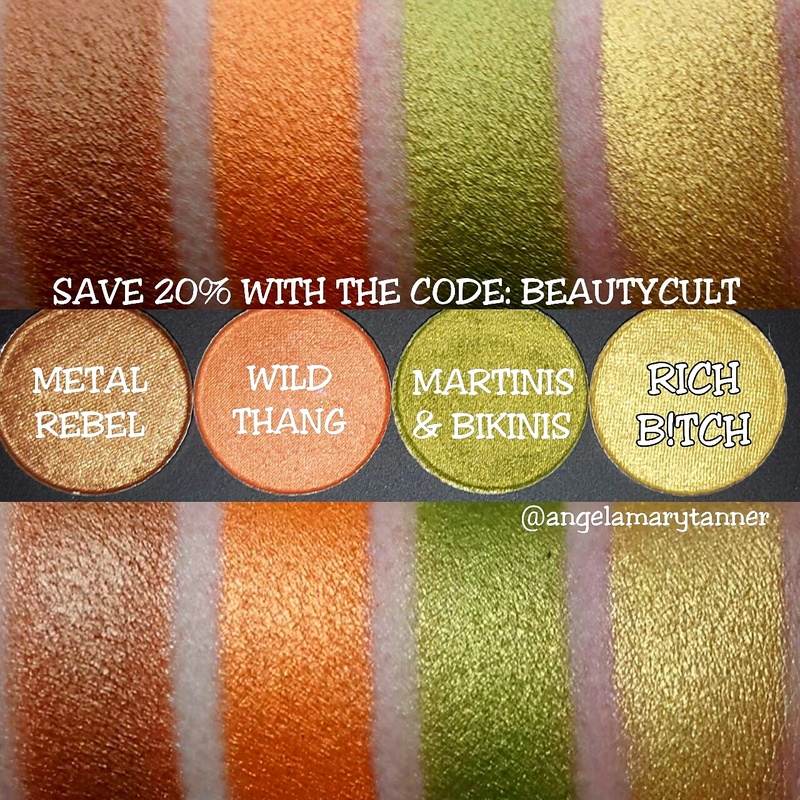 MARTINIS & BIKINIS is warm grassy green with gold shimmer. RICH B!TCH is a sunny yellow gold. All four of these colors are going to look good on almost everyone. I feel like people are intimidated by bright oranges like WILD THANG but it’s such a flattering color. Of course it’s going to look great on blue eyes but it’s also really going to make brown eyes pop too. And even though it’s bright, it’s more like a Creamsicle color than a fluorescent traffic cone orange. Anyway. I like that color and I think you should try it! MARTINIS & BIKINIS is another good one. Olivey greens flatter pretty much everyone. And of course who doesn’t love bronzes and golds?? We’ve reached the end folks! 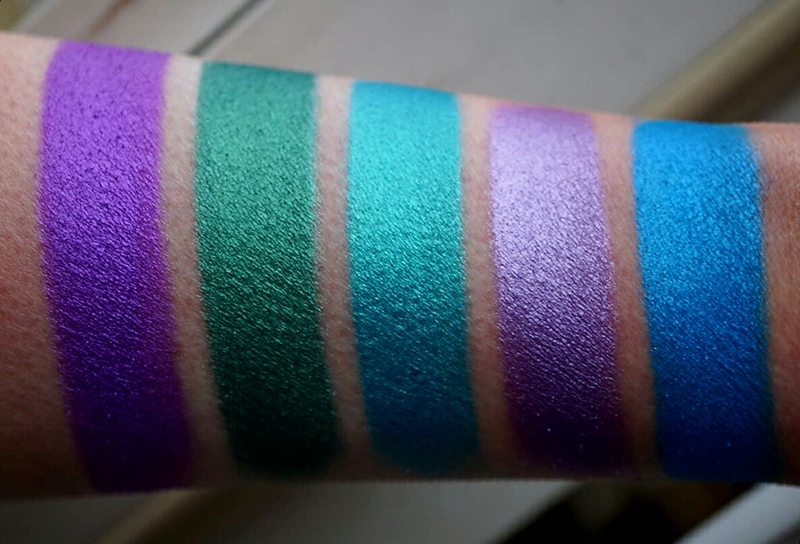 These are the final five eyeshadows that I’ll be reviewing for you guys. 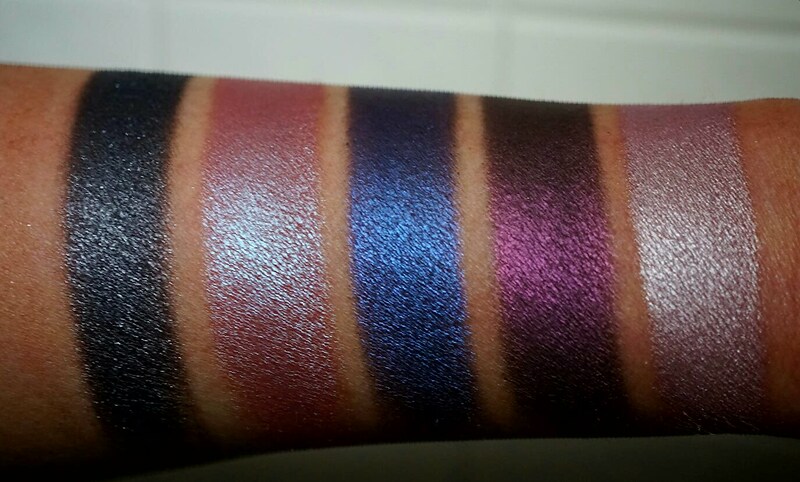 HIGHEST VOLTAGE is deep royal purple with a metallic finish. LOVE BUD is a deep shimmery emerald green. 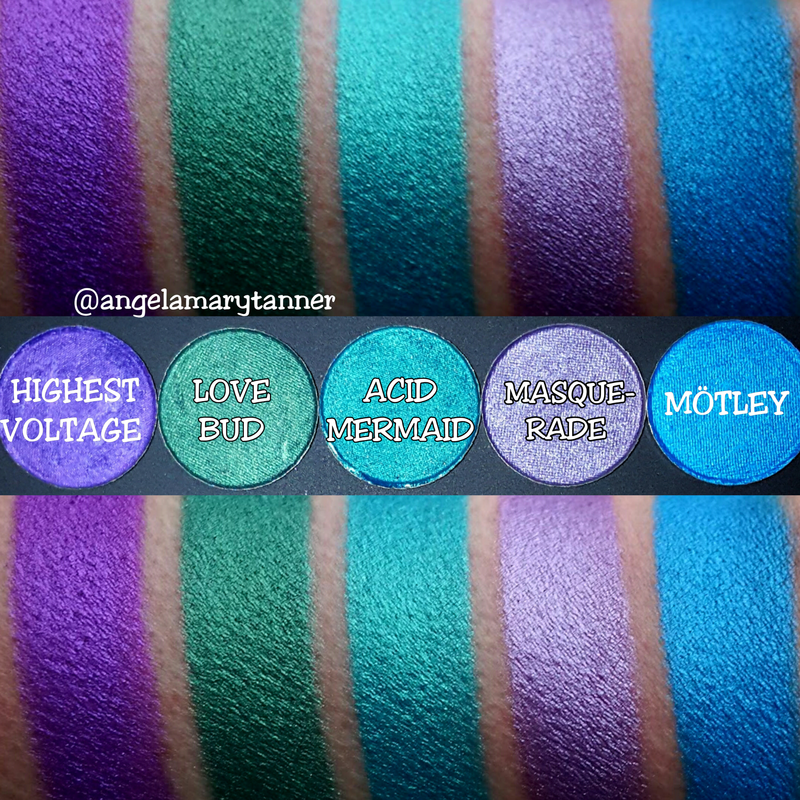 ACID MERMAID is bright aqua with gold shimmer. MASQUERADE is pale lavender with a hint of silver. Almost like a subtle silver overlay. MÖTLEY is a bright cobalt blue. JOHNNY CONCERT eyeshadows are sold in pan form for $10 each or in compacts for $13. They’ve got about 10 other colors in addition to what we’ve looked at in this blog post. And they have a number of different bundles that you can buy at a discounted price. They’re also working on lip products and blushes. 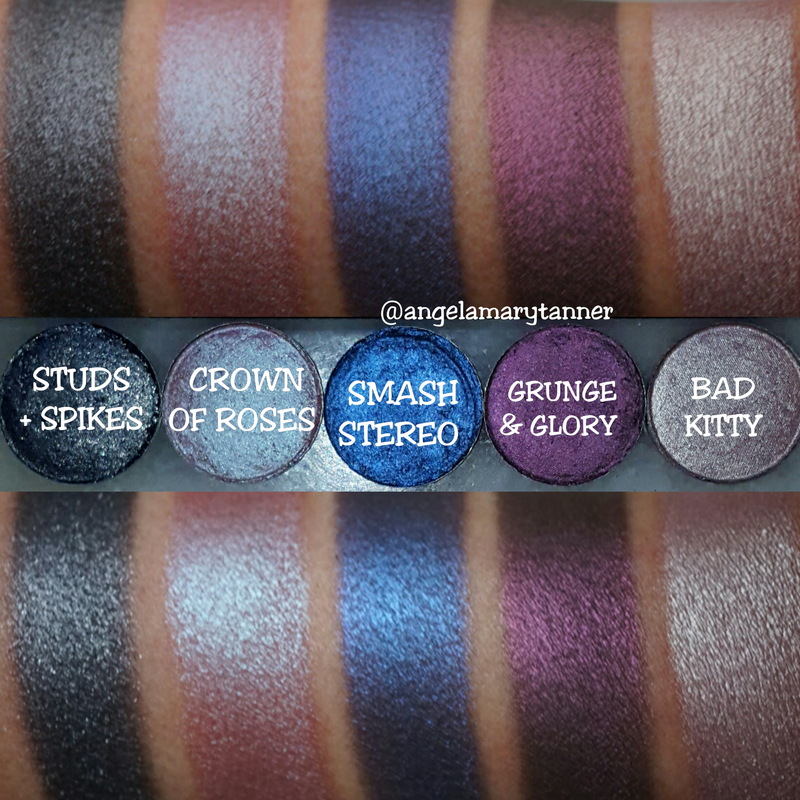 My favorites are CROWN OF ROSES, GRUNGE & GLORY, TRAGIC MAGIC, AURA AURORA, SCENE QUEEN, BLOOD MOON, LOVE BUD, METAL REBEL and WILD THANG. If you’re interested in VEGAN makeup (and even if you’re not), I suggest checking out JOHNNY CONCERT if you haven’t already!